This innovative text explores the cellular transport of organic cations, from functional and structural properties to pharmacological implications and psychiatric developments. 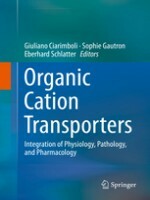 The authoritative chapters introduce organic cation transporters and then proceed to discuss their mechanisms such as binding of substrates and inhibitors; their drug dispositions and toxicity; their relationships to genetic and pathophysiological variability; and their roles in endocrine, metabolic, and neurological systems. The final chapters delve into the use of animal models for the study of organic cation transporter function and their possible use in environmental cycling of pharmaceutical residues. This comprehensive volume unites integrative transporter physiology with structural and molecular biology, genetics, pharmacology and pathophysiology, offering a holistic approach to utilizing this novel technique in physiological contexts. It will prove invaluable reading for researchers and students in various areas of integrative, organ, cell and molecular physiology as well as pharmacologists and neurologists.